The 2017 Grammys weren’t fair to Beyoncé or Adele. If you won’t fix yourself for Beyoncé, please fix yourself for Adele. Adele accepts the award for Song of the Year for “Hello” during the 59th GRAMMY Awards at Staples Center on Sunday in Los Angeles. The morning after, here is my public entreaty to the voters of the Grammys: Please, please, please, stop doing this to Adele. That is: If you really won’t be motivated by a deeper awareness, fairness, and responsibility for, in particular, black lives and culture, the motherlode of American popular music, arguably the major reason most of you have careers … Well, maybe you bunch of graying palefaces (from which I don’t exempt my middle-aging white self) might at least have pity on Adele and the other white artists you sometimes-justifiably love. When you over-reward them, they end up wearing the shame of your collective racial blinders. And by extension, America’s. Just as poor Adele did Sunday night, by winning. Without that imbalance, it might not seem so obligatory for you all to be so directly political right now. Music manifestly doesn’t have to be dissident to be great music. But with that cultural skew, almost every second that it was less outspoken, the Grammys broadcast seemed like an effort to subdue and distract. Even when it was trying to do the opposite. Consider Sunday afternoon, during the pre-show part of the Grammys that most people never see (but when the lion’s share of the awards are given). Comedian Margaret Cho, hosting, reacted to a powerful performance from the Alberta-based First Nation group Northern Cree together with Mexican singer Carla Morrison by praising the diversity of the music-industry awards: Casting side-eye on the Oscars, Cho predicted that no one ever would see the Twitter hashtag #GrammySoWhite. I winced, not for the last time in the day. Knowing the Grammys, I found it obvious she was speaking too soon. And Monday morning, the tag is everywhere. If memories of a minor Beck album beating Beyoncé’s industry-changing one in the 2015 ceremonies or of the milquetoast Macklemore taking best rap record from the fiery Kendrick Lamar in 2014 (and then cringingly apologizing via Instagram) weren’t fresh enough warnings, another pre-show gesture was a mammoth tip: One of the few prizes left unawarded was Best Urban Contemporary Album, the academy’s euphemism for forward-looking R&B and a category Beyoncé’s Lemonade was a lock to win. 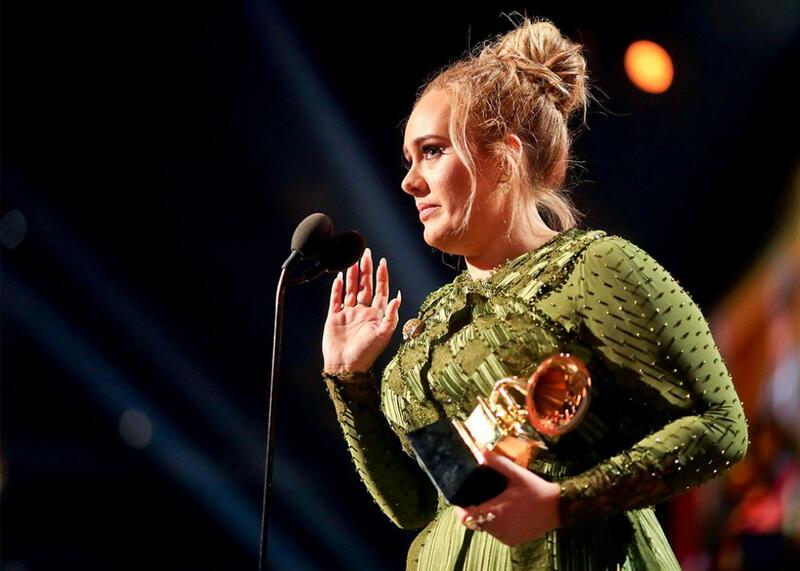 Everyone knew this year’s Grammys were a showdown between Beyoncé’s rapturously received April visual and aural album and British belter Adele’s sales record­–setting 25, from late 2015 (which through no fault of her own now feels a lifetime ago). The two were competing for Album, Record (as in singular recording), and Song (as in best songwriting) of the Year, all the high-profile prizes except Best New Artist. By putting Urban Contemporary—in which the other nominees were worthy but relatively obscure—in the live telecast, the Grammy producers were making sure Beyoncé would get a speech on TV, even in an Adele sweep. Which is the Grammys’ current pattern: use black performers to draw viewers but bypass them for the main awards. Thank you to everyone who worked so hard to beautifully capture the profundity of deep Southern culture. We all experience pain and loss, and often we become inaudible. My intention for the film and album was to create a body of work that would give a voice to our pain, our struggles, our darkness, and our history. To confront issues that make us uncomfortable. It’s important to me to show images to my children that reflect their beauty, so they can grow up in a world where they look in the mirror—first through their own families, as well as the news, the Super Bowl, the Olympics, the White House, and the Grammys—and see themselves. And have no doubt that they’re beautiful, intelligent, and capable. This is something I want for every child of every race, and I feel it’s vital that we learn from the past and recognize our tendencies to repeat our mistakes. This wasn’t a problem just because of racial dynamics in a moment when the new White House administration and its “alt-right” (i.e., white supremacist) supporters are dragging America back into its vilest vortices. It’s a problem because—as is almost always the case in these faceoffs—Adele’s album, as finely wrought as it is, is simply not the vital bundle of energies and innovations that Lemonade is. Adele knew it, too. She graciously accepted her accolades until near the end of the evening. But when she got the album prize, she said, tearfully and earnestly, “I can’t possibly accept this.” Although then she did. No doubt because she didn’t know what else to do. Adele also said she wished Beyoncé could be her “mommy,” having just mentioned how hard she found it herself to be a mother and that she did not love her own dad (fairly remarkable things for an awards-show honoree to say, reminding us why people love Adele’s frankness). She was genuflecting to Beyoncé’s instantly iconic pregnancy with twins, the theme of Bey’s show-stopping, gravity-defying, mythopoeic-African-matrilineal, performance-art set of “Love Drought” and “Sandcastles” earlier in the show (touchingly introduced by her own mom, Tina Knowles). But the “mommy” line was still too presumptively intimate and invasive on Adele’s part. Overall, despite the “Hello” singer’s well-meaningness, despite her gesture being much braver than Macklemore’s after-the-fact apology, her speech will go down as more white tone-deafness—which, for someone whose fantastic ear is her calling card, is sourly ironic. Maybe Adele should have stepped down from the stage and handed the statuette to Beyoncé directly in her seat. But that would have been a hard, ungrateful-seeming, and, as far as I know, unprecedented act. (The closest I can recall is Marlon Brando turning down his Oscar for The Godfather in 1973 for political reasons, but he didn’t do it in person— he sent a Native American woman in his stead.) Even Kanye West, who’s so often anarchically acted as the racial subtext–exposing conscience of awards shows (including this year, by not showing up), has never done it, though he, too, has said from the stage that awards he’d won rightfully belonged to others. So again, Grammys, please, stop putting people in these positions. Positions where Rihanna and Beyoncé smile through gritted teeth or sparkly flasks. Where Adele stumbles over herself to make amends for you. And where Frank Ocean, who put out one (or two) of last year’s most-praised releases, doesn’t even bother to submit for nomination, because he doesn’t believe you have any credibility. How to fix it? After the furor over whitewashed nominations in 2016, the Oscars made much-needed reforms. I’m aware that the music academy makes efforts at recruiting more diverse young members, though Ocean’s stance demonstrates the barriers there. And the Grammys already do better at the nomination stage than the Oscars do. The problem is what wins. And that’s down to the demographics of the voting body, as well as the faster-changing nature of music culture. The Oscars have decided to rule out people who haven’t produced work in a decade or more, which can help because Hollywood is such a big machine—even in the digital age, it’s dicey to make movies on your own. Not so with music. There’s already a rule that you have to have worked on a release in some capacity in the past five years. But old duffers have home studios. For the Grammys, a more ruthless approach to grandfathering-out would be necessary. And it is necessary. Otherwise, senior citizens still will exercise a de facto veto in the big categories. The Beyoncés and Frank Oceans will go on being also-rans, and the industry’s Becks, Adeles, and Taylor Swifts will go on being tainted winners. And the Grammys’ grasp on reality, if any, will get flimsier and flimsier. Hillary Clinton loyalist Katy Perry in turn wore a “Persist” armband (referencing the viral slam by Republicans against Elizabeth Warren this week) and a white pantsuit, with a hairstyle you could interpret as a solidarity nod to Kesha. Still, Perry’s performance of “Chained to the Rhythm,” about the perils of a complacent “bubble” of awareness (symbolized by a suburban picket fence that rotated around to display mirrored spikes and Skip Marley and a projection of the Constitution), was way too overthought—in the same mushy middle zone of only-protest-if-you-want-it-to-be that Gaga brought to her Super Bowl halftime show. Which is far too hedged for the current political mood. ATCQ, could you please hold some training sessions? Adele’s attempt to pay tribute to George Michael was cursed by technical issues that made her stop, bleep!, and start again, determined not to repeat the microphone-and-monitor foul-ups that hobbled her last year, especially in Michael’s memory. It was a boss move, and more power to her, except that it made the lugubriously solemn, gothy arrangement of Michael’s joyfully profane “Fastlove” she was saddled with seem even more torturously dragged out. Mic issues resurfaced soon after in Lady Gaga’s campy ’80s-video-vixen duet with Metallica (“Metalligaga,” as the interwebs had it), in which poor old James Hetfield’s mic wasn’t even on. I assume people were getting fired at that point, permanently? For “Music’s Biggest Night,” the Grammys’ sound standards are damned shoddy. Morris Day and the Time were nostalgically superb in the Prince tribute segment, even if the cameras cut far too often to big rows of white Grammy-goers bopping half-heartedly about. Bruno Mars in turn was great without actually being any good. His choice to wear a Prince Halloween costume and attempt a showily second-rate Prince guitar solo (on a Prince symbol–shaped guitar) was at once preening and off-puttingly necrophiliac, like the best-ever wedding band you never would book. He was so much more charming with his own much-worse material, and there have been so many finer Prince tributes by now. Between Adele as George Michael and Mars as Prince, one wants to ask, where were the queers (or at least the queer of spirit) Sunday night? Well, there was Laverne Cox. Who called out to her “gender nonbinary peeps”(!) and to Supreme Court trans teen petitioner Gavin Grimm in the course of introducing Gaga and Metallica. Nashville sorta-maverick Sturgill Simpson, who was bruited about as a potential (and, despite his real talent, even more retrograde) spoiler who could take the Album of the Year Grammy from both Adele and Beyoncé, did a fine set with the Dap Kings (the band behind the late Sharon Jones). The horns and backing vocals reinforced the idea represented by Chance, of the gospel/soul roots of American music in general, from a country point of view, just as Beyoncé’s duet with the Dixie Chicks did at the Country Music Association awards in November. However, without Jones, the mostly white Dap Kings do seem rather like a theme-park version of soul. Shall we never speak of that Bee Gees karaoke, supposed tribute again? Likewise, Ed Sheeran’s turn as a one-man band eking out his trade on the corner stage of a douchey surf bar? I don’t hate Sheeran, since how could you, but still. Likewise, host James Corden’s sub–Dr. Seuss white-man-raps, um, thing at the top? I liked his pratfalling self-deprecation, until that happened. He had his moments. No one will remember them, except maybe Neil Diamond. At least LL Cool J has been liberated from his own hurried-hosting-years jive. Michael Jackson’s daughter Paris says, “We could use this energy at the next pipeline protest! #NoDAPL!” It was like she crashed the place with nonshowbiz feelings, in a happy way that made me want to believe the abusive family chain has been broken. Even as she reminded us of other abusive chains. J-Lo quoted Toni Morrison early on, which may have led us all to expect a more interesting night. Daft Punk and the Weeknd, in their Fortress of Solitude, weren’t bad on Starboy’s best song, “I Feel It Coming,” at least given Abel Tesfaye’s general stage stiffness. (He might have liked a Daft Punk dark-imperial-emperor cape and mask of his own.) It was a step in Tesfaye trying to shake off his exaggeratedly creepy image. But no one will ever, ever think of those few minutes again. It was hard to tell if the Chainsmokers dudes were sure who David Bowie was, when they helped award him one of his many posthumous rock prizes, or if they were just in a hurry to get another Jägermeister. If they really didn’t know, partly blame the Grammys: During his lifetime, the original Starman only won one little gramophone, for a half-assed music video, aside from a couple of late, hall-of-fame kinda things. He won five times as many last night. RIP. “Thank you, Miranda”—Grammys president Neil Portnow dismissing a random “America the Beautiful”-playing trumpet soloist, amid his half-baked testimony to American music and unity that then morphed into a WTF complaint about specific music-business copyright legislation. Worst, most self-serving political speech of the evening. Can “Thank you, Miranda” please be the new “Bye, Felicia”—for patronizing, exploitive, establishment jerks?